To view 2 more pictures, interactive maps and the full, detailed description of the Nichols Park at Lexington community, please Login. New home communities like Nichols Park at Lexington show off the ingenuity of the builder in every townhouse. Homebuyers seeking a low-maintenance lifestyle in Hampton Roads can find the perfect blend of traditional charm and modern features in this development. 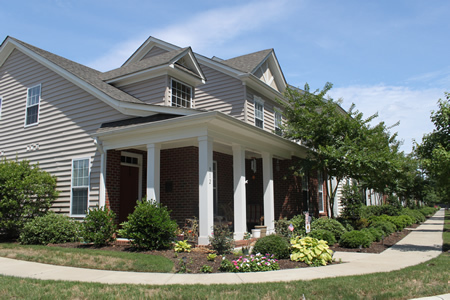 Centrally located in Virginia Beach, VA, these townhomes are within close proximity to Sentara Virginia Beach General Hospital and military bases like NAS Oceana, the Coast Guard Finance Center and Joint Expeditionary Base Little Creek-Fort Story. The builder here gives buyers choices when it comes to selecting a townhouse. Homes may have two or three stories and two to four bedrooms, depending on which model is chosen. A townhome at Nichols Park at Lexington may include garage, professionally landscaped front yard complete with sod, wood deck, front balcony, kitchen island, 42-inch custom Armstrong kitchen cabinetry, Kenmore appliances, separate shower in master bathroom with glass doors, antique nickel door hardware and more. New home communities usually have some kind of added bonus to sweeten the deal but not like this. At first glance, it may seem like the builder may have thought he was constructing a vacation spot instead of a place to live. A pool, cabana, fitness center, media room and playground are all amenities fit for a resort hotel. Townhouse owners and their guests can stay fit, meet new people and have fun in Nichols Park at Lexington. To live in this area of Virginia Beach can be a good way to adjust to a more active lifestyle. Kempsville Green Golf Course is a nearby venue for all those rounds of golf residents may want to play. Eat out, shop and catch the latest new movie at Lynnhaven Mall. This region of Virginia is never lacking in things to do or people to do them with. A townhouse can be the best of both worlds; spacious and personal enough for families and cozy enough for singles and couples. Whatever stage of life you’re in, this place stands out above the other new home communities. Nichols Park at Lexington is a crowd pleaser, so come be part of this crowd. Send me more information about the Nichols Park at Lexington new home community.